Some "real life"-impressions can be found here . The new monastery, "Big city of nuns", a huge areas (~150-200ha ?) 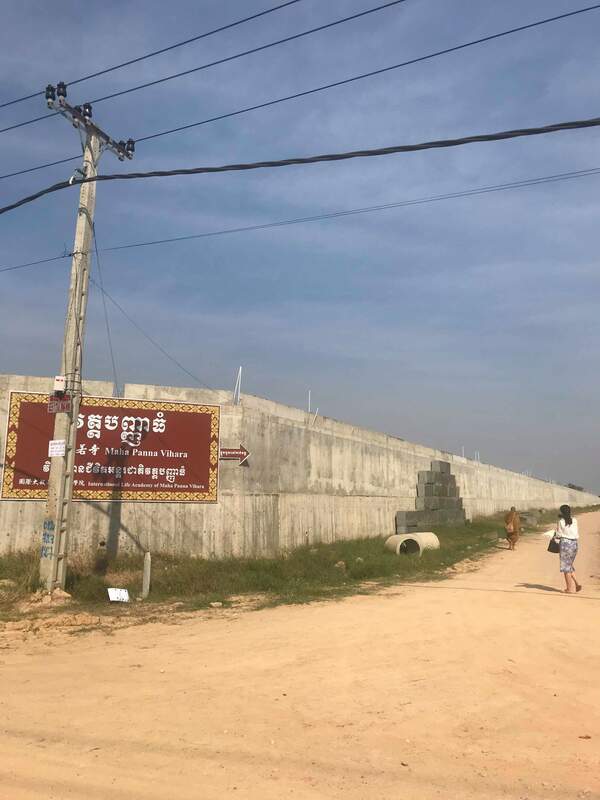 "castle" around forest in the industrial area, surrounded by Cambodians largest wall and only one door, lies about 1km west of the old monastery at the near end of the "Railway-street" from the airports former door. About 20 Nuns are dwelling on this grounds, nearly exclusively from Chinese/Taiwanese birth, some speaking also English and Khmer. A possible equal large community of lay people and assistants, both gender living and care for all task around the monastic tasks. 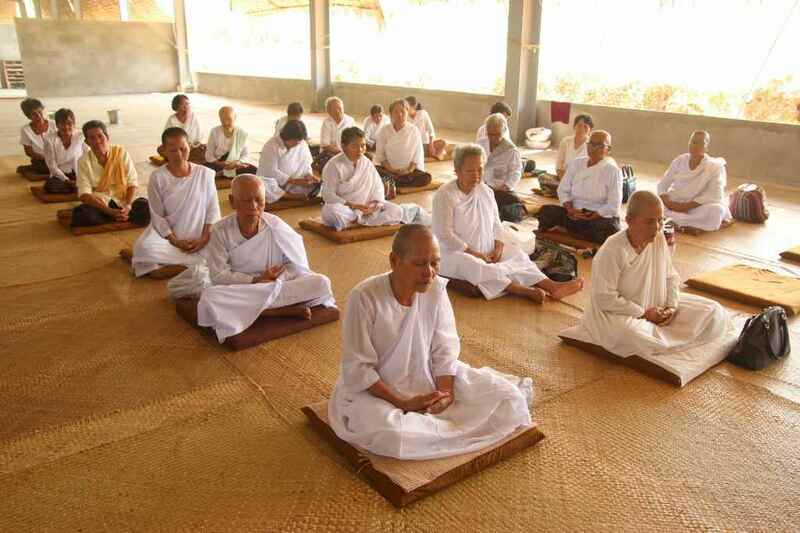 Some devoted Cambodian Upasikas train their as well. The somehow strategical seeming isolated community appears very devoted to Dhamma and Vinaya, appearing to act very proper and respectfull and is surely something one can call an outwardly sample-model like designed on a table and worthy to get known and discovered what ever might lie behind, yet of cause a huge soon future national food for political and social conflicts and visible also a likewise global "playground" for two different worlds and inclinations. As long marxist ideals and kinds of imperialism appeared for many, ordinary people have been always be quickly impressed by the detail organised of power in form of material appearances, taking easily what is subject of much pain and decay as real and secure refuge. This demonstration of industrial perfection in clothes of certain spartanic ppearence, is the more a dangerous attraction for females, as ever, and a huge magnet of delusion, ever since having soon destroyed generations, covered under social ideals and mass - identification. It's a matter of nature that those seeing the danger are touched by certain valid fear and it's natural that huge movement, views, soon gain their conterparts. One one hand very much mudita with possibilities and gain, if for the proper direction, it would be not right if not telling about the huge dangers growing and to cover a more dominant mind of compassion leading to certain equanimity by reflecting that beings are heirs of their own actions, impossible for another to control or help. Diverent to certain ordinary views, the Buddhas value betweens community for becoming and being and individual real liberation, is focused on the second, putting certain strong care on the first simply for the possibility of those ready to be taimed and not much outwardly, for even investing there where foundation are not developed yet, yet at the same time providing for the source that such can be developed for many, not disturbing the way thing are desired in the world at the same time. May this huge concentration of power (in both directions) be used for the right direction for not only all single infolved but for the very future of existence of the Savaka Sangha, Arahats, the Dhamma in this world. May there be the possibility for many femal devoted come into being, be not wasted for short lasting refuges, to train themselves in the holly life, "unsecure", dusty and undesired by those with much dust in the eyes. It's possible of conductive value tfor some able to trace ways into the right and out of the wrong, so my person thought to reflect here a little, unhidden and open like ever. The story of certain Upanissaya actually "began" a long time ago, not possible to trace to a beginning and will start at a point where having got touched in this existence. Some 7 yeas ago, living actually near the monastery, my persons good attending admirable friend, Upasika Sophorn , got informed by neighboring friend, who had a vietnamese friend, about a nunnery near and so visiting the "yoa practicing, fermented consuming, therefore lot of farting community" (from a reminding report of special appearence afterwards, reformulated by my person's tendency of provoking possible helpfully). Living as "Anagarika" my person let go of his last possessions, Dhammabooks, incl a old translation of a merely unknown sect, and had them be given to the lone Abbott of the monastery before leaving the last householder signs behind, for a kassapish (knowing his story now, it seems to be a useful competition to understand) way. It was somehow clear of not being the right time or need to meet personal. Having been requested to visit two gravely ill Upasakas in the capital, my person was on walking the sharp stony highway to the east, the secound day after having left the forest and mountains of Aural. Later in the afternoon, foots already hard to move, no good place for spending the night seen yet along the desertlike highway a voice called from behind as the thoughts about dwelling came up. Not usual to either turn back nor to react on far voices, my person walked on. After some times the heavy breath and steps of a older seeming woman came more near and at a certain point a 60, 70 years old woman stood in front: "Lok machas, lok machas (Ven. Sir), may Lok Macchas accept to come into my house, may he spend propably the night as our guest. May Lok Machas accept this offer. Having accepted the offer, my person went the 200m back, receiving kindly welcome by the Upasikas female family members near, including here niece, visiting a night. After having been asked in skilled ways from the young Upasika, semingly well learned behind artifact modesty "oh, a Buddh Sovung disciple", the thought, my person soon spoke of the faults and dangers of learning without leaving house, letting go (practicing, putting the talks into action), at least of the hindrence the increasing pride would manifest. Short after she declared to seemingly being a very near student/assistant of the beloved teacher Buddh Sovung, but did then leave after having conducted what is proper to do. They organized soon a younger male to assist and attend the talks soon, having remembered on hints. The inviting Upasika had a very proper and seperate small dwelling place for monks behind their house and it was a pleasure for all to provide such devotions also toward my person. Before leaving in the morning, having spend a comfortable night in the backyards open, my person asked about the address of a Vinaya monastery, the young Upasika mentioned. Short spoken of the undertaking of transcription of the Tipitaka by Upasika Norum and my persons receiving, she told that the Bhikkhunis of Maha Panna currently organize to have the Bhikkhuni Vibanga new translated, now by a Mahavihara near member of the Mahanikayan Sect ... "but that is all a matter of personal freedom in ones choices of the individual", she ended, trying to transport hereby that such is not very supported by the Buddh Sovung/Mahavihara hardliners. The tought arose that the Dhammayut monastery next the airport, my person thought to use as entering point into the capital, would not be far from the monastery and if occasions appear, possible good to visit, properply a good time. How ever, having walked on, two days later my person arrived at Wat Sophea Kun. The grandchildren then soon visited my person there, and my person got shown the map to the uncles house. The place and way right next of the monastery. Having thought it would be very helpful if the sick could receive some of the female Samanas, having been attended by Nyom Vithou walking for alms in the morning, going toward the uncles house, having "accidently met some former neighbors in the total urban grown district, short ago still all fields, and a little assisted in regarding of getting sure walking the right way, two Upasikas, grandchildren, jouned the walk short before the monasteries access street after having taken the meal on an single open field inbetween. So it was now clear to approach the nuns and soon all arrived at Wat Panna, my person could remember the place and appearence by having been told about years ago. The young Upasaka and Upasikas where visible very exited, nervos but also very joyfull to not only get in contact and known but also to have possible the chance to invite some nuns for their uncles long well-being. The very chinese styled small and strikt designed old monastery was nearly empty aside of two nuns just sweeping the foreplace. They properly received all accordingly and informed that there is now a "Wat Wisdom big", telling that we best go on a little west and meet the abbott and nuns there. Nyom Villa and her cousin Puthy have been more then pleased to serve the nuns there a little of which one, touching of cource, was bound to a wheel chair. Having the luck to be able to make some small offerings, they then followed may person after having left. Walking a little, seeing a massive huge wall in the opend field from far, after the "sad" thought had been arosen, it was not of long lasting to maintain the thought: "not sure, maybe is just something else on the way. Even after having crossed the south-east corner, hopeful thought "there will be some proper behind this castel-building, even "decorated by huge stone-blocks, billions heavy pain and suffering for where no refuge can be found", arose. But at the door, seeing some buddhist flags behind first organisation-flags and then national cambodian flags, it was clear. And orange monk was just guided into a car bringing him back in his home. Having entered the militarian bunker-like door, relatively small, hidden, and secure adjusted, two younger nuns approached my person in very proper and kind manner. Having made clear to wish to meet the abbott, my person and the small group of devoted were guided to wait a little on a seperat place. Short after the Ven. Abbott approached with the two other Ven. Being already nearly noon, the welcome, paying respect and introduction was only short, coming to the importand part, the Upasakas invitation for a meal, quick. How ever, it did not lack on any proper way at all and was very unusuall exemplary and correct. Having gotten the acceptance from the Venerable ladies, the female lay people joyfully took the opportunity of a lay organized transport to be able to guide the three Venerables timely for a meal at uncles house. Having left the giving of the possibility of making use of sangham, ati.eu and zze, as well as to dwell in the forests at Aural to the community behind, my person walked on to Nyom Vithou's uncles house, some 3,4 km further to walk. Arriving at the house a little later my person has been welcoming received by all, having done their meals. Going up to the sick Venerable Kammaṭṭhāna generously gave a talk on Dhamma which aside of the talk was another kind of medicine for him, having been known as being a very pride person, he devotional was able to receive. 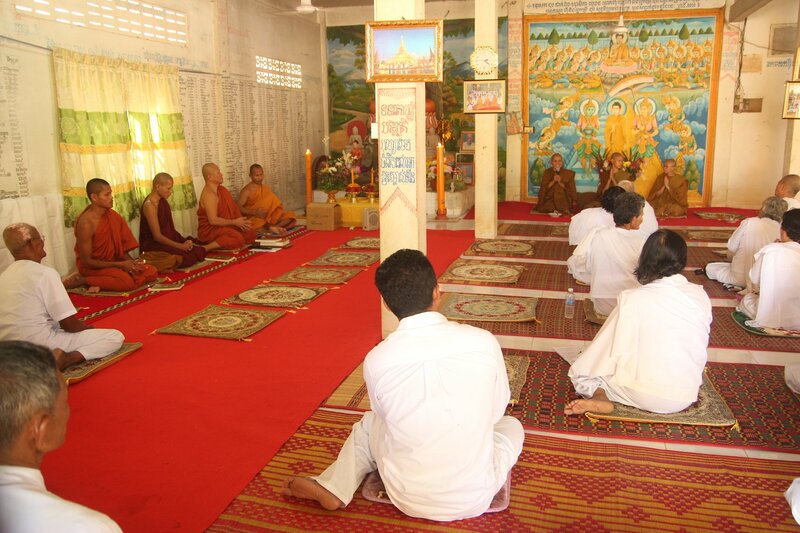 It was a matter of last bodily power that he wished to sit upright while receiving, and an effort of all lasting mind power to try to receive the Dhamma not only in had understandable Khmer but also total foreign from "Bhikkhunis", something that "does not exist". Even on the cost of the last resources of him, he devotional listened and received. After my person continued with Dhamma some time, all left him behind with his task received and having to do for himself. Having had spoken about my person possible spending this night location and having short remembered on the forest in the castle, the Venerables kindly offered to use the possibility to stay at Wat Panna (old), where he then walked. After having been received by a group of young male monastery assistents, having received dwelling and all needed in total the seldom correct and careful hospitality and praiseworthy way of welcoming, adviced by the abbott, was soon provided, incl having my persons robes washed, not easy to organize carring just three while the small lay comminity, after having invited to receive a meal at uncles house in the morning, left. Already a little burdened by stronger cold and fieber, in the evening, the abbott and a few other Venerables came to look after the situation personally to Wat Panna, and on this occation they requested my person to give a talk at Maha Panna, to the community, in the morning. Told that it would be not possible in the morning, two afternoon was agreed. It was a desire of her heart that Bhante expressed that she is very pleased and touched, being reminded on here instructor, a 90 years old forest dwelling nun, many years ago went she ordained. Next morning, having walked to the uncles house again, having received a meal, having given a last talk to the sick Upasaka and strong encouragements to look only after his task, having talked on the importance of Sila first and only then generosity to the families lay assembling, my person told about meeting the nuns in the afternoon and that it would be good and proper if Bhante Indaññāno could actually lead the talk. Quick they not only organized to ask him on telefon, but also quick organized the transport after hearing the clear and quick responive reaction on my persons request "yes", without much to talk between all. Upasaka Vithou had also organized a print version of Bhante Thanissaros last generosity in explaining certain issues related here, which have been personal given to the Abbott. In the afternoon, my person had to take an innormal daily rest, Bhante arrived at Wat Metta and short after two Venerables came to guide by following. Having my person lead the short walk and approach, Bhante has been placed to take the most proper seat to give a talk after having been most respectfully nd proper received by the whole parisa there. After a short introduction and some fundamental questions to get aspiration known, the question answer session soon was directed deep into Satipaṭṭhāna and practice and took good cause even the language difficulties, Bhante Kammaṭṭhāna always tried to compensate, and the refuse of using microphones for a talk on Dhamma by my person on such a good occasion, no outward support needed. Maybe 2 or three hours later Bhante and my person returned to Wat Panna and spended the night there. While Bhante soon left in the morning my person, more struggled by bodily sickness, stayed another night althought the planned visit of the 7 day funeral fest of the other uncle was cancled by Upasaka Vithou, thinking it would be to burdensome for my person to go another time. The morning after my person left, having been provided with medicine by the nuns attendants. On the first evening my person lightened himself another time, still carring the only owned Dhammabook with him, he received from Bhante Indannano after his dwelling at the forest monastery of late Ariyadhamma in Sri Lanka, remembering that it is written in Chinese as well and thinking the young monastery students surely never have heared or read the good Dhamma, and so there was also good outwardly letting go as well. Crossing along the monastery walls silently, having taken the meal received at pannas doors (only in total non-dhamma areas appearing, nearly never:) not having gained even a little in the small village next the monastery, resting in the shadow-less open fiel behind the castel, my person walked then on, disappearing another time from worlds streets of contact: "May who ever has the possibility, in what ever circumstances, take on ones chance to follow to live the homeless and holly life." May all have a conductive share of the merits and goodness having lead to get intouch, probably able to give much nurishment for sublime Upanissaya so that it may increase and last till it has dones it's task. Some pictures have been given by Upasika Cheav Villa here, for the possibility of rejoicing of who ever is able to receive this gift of letting be part on the blessings and merits by many having come together here . There was a beautiful princess from the Wei dynasty who liked to dress up fancy. She had an embroidered gown with feather on it. The sparkling shine made her look like a fairy. One day, the king saw her in this dress and spoke to her in a serious tone: “Take off this gown right now and never wear anything with a feather.” The princess laughed and replied: “How many feathers do we need for a dress?” The king said: “You are the princess of the country. I am afraid that the royal families will all take after your example. Even more, the common people will do the same as well. The merchants will do anything they can to catch birds for the feathers as long as there is money to be made. If so, the countless lives would be taken because of you. The sin would be unimaginable. He who tries to conquer others, makes enemies of all. Only he who is ready to accept defeat from another man alone be a friend in this world. The king wished to conquer the whole world so the whole world was his enemy and his fear had increased a thousandfold. When fear increased, it became necessary to make provisions for safety. He built a big palace with only one door. There were no other doors and no windows; not even a hole for the enemy to work through. Only one door - guarded by thousands of soldiers with naked swords. The neighbouring kind came to see this much-talked-of palace. He was terribly impressed and determined to make a similar palace for his own safety. While taking leave, he praised the king for his foresight and wisdom and reiterated his desire to follow his example. An old beggar sitting by the roadside heard this talk. He laughed aloud. The owner of the palace chided him saying: "What makes you laugh, fool?" "Since you ask, Sire, I shall take the opportunity of telling you," said the beggar. "There is only one flaw in this marvellous structure. It is impregnable except for the door. The enemy can come through the door. If you step in and have the door covered with brick and mortar, it will be completely secure. Then no enemy can ever enter it." "If I do as you say, you fool, this palace will become my grave," said the king. "It already is," said the fakir, "except for the door. Through this door the enemy can come, and if not the enemy, death is bound to come." "But I will be dead before that!" raved the king. "Then understand this well." said the fakir. "As many doors as you had in your palace, so much of existence was with you. As you decreased the doors so also life diminished within you. Now one door is left - one lone opening to life; close it and shut out life forever. Therefore I say, there is only one flaw." And he broke into peals of laughter again. "I too had castles, your majesty,"the fakir continued. "Then I felt that they were no more than prison-houses. So I began to widen the doors and separate the walls. But I found that no matter how much I widened the doors the walls still remained, so I got out of the walls and came out in the open. Now I stay beneath the open skies and am alive in the perfect sense of the word." But have we not all built as many walls around us as we possibly could? The walls that are made of brick and mortar are not that dangerous, for they can be seen. There are other walls - subtle, imperceptible walls.... These are the hard screens - glass screens of concepts, of doctrines, of scriptures. Absolutely invisible! These walls we have built around our souls [mind] for complete security The thicker the walls, the farther it keeps us away from the open skies of Truth. Then the soul [mind] becomes restless and struggles; and the more agitated the soul [mind] is, the more we strive to strengthen the walls. Then a fear grips us - perhaps this struggle, this restlessness, is due to the walls? The answer is "Yes." As long as the soul [mind] is confined, it cannot attain bliss. There is no sorrow except in captivity. There are neither shoulds, musts or possibilities to specially force even for one self, but there are door of previous build Nissaya all the time opening and closing along ones ways, depending on the paccāja previous given into upanissaya and it's the heartwood of the Buddhas teachings that the releasing as well as binding decisions, after good or bad investigation, actually allow the escape of the wheel of giving and taking right in the present moment, so if thinking on the five proper times for giving into something, it is that simply guide that one knowing the direction desired will find there even in forest, far off road and total unknown land not scared that it's always possible to walk a way back if clear that it later bends into the wrong direction. The fastest and most secure way is not found on highways althought required to walk sometimes if all forest has been cut and the land is devided by borders, but crossing all kinds of present fields most harmless directly in the right direction. It's not always assumed that a most burdensome way actually lead to the most comfortable shady forest sand path and happens vici versa as well. Of what s not known, what else then assumings can be made. Walking merely "guidless" outwardly through total unknown land, only direction known and maps signs reminded is a good teacher in regard of kamma and vipaka, and that ways are always not constant, changing and subject of decay as well. Where some years a single smal path was easy to use to cross huge forest, today only less would be able to trace the right track in the manifold of the mass of wood cutters roads and hindering borders inbetween. So to have the luck to find a still maintained path in this late times one should not wait long as they will soon no more traceable under the many artifacts build instead. All one can lose by letting go, if letting go of the right, is the wheel of suffering and there is nothing to worry on the Buddhas offer since it not proper it has a 100% coming back guarantee, for if scared following wrong promises. Where ever the virtue factor of the path can be remorseless completed, that's the path which is proper to follow according ones Upanissaya and wise choices of maintaining the fruitful field of merits of one correcting time by time the direction, possible the kind of enviroment, not easy to chance quick often requiring to clime over borders and fences, changing the touches of sharp stones to sand, hot sand to grass with its thorns, to soily roads into deep forest, back... it's "easy" to follow ones moods and used, hard to jump to cold water so refreshing it then might be, or for a child to leave the waters pleasure by time. It's good to leave all doors always open, either if leaving or entering, haven made known the other well and wise decided, Nyom Cheav Villa . Those who maintain "wildness" paths, possible not walking, not knowing it's destiny, would have a lot to bare it being not simply the path of the/a Buddha well traced out, when provided to others, yet a attentive wanderer with certain"luck" may always be able to use parts of maintained streets proper according his inclination and lying on the way into the right direction. At least the very path has been walked, is walked and will ever be walked alone, sometimes leaving some useful traces for others behind, a small and tiny path, like the tracks of forest animals to a refreshing pool where no bottles are sold at all. Ein oder mehrer Beiträge wurden hier im Thema abgeschnitten und damit in neues Thema "Personal impressions visiting Pañña &amp; Maha Pañña - Nun-monastery, វត្តបញ្ញាធំ " eröffnet, dem angehäng. One or more posts have been cut out of this topic here. 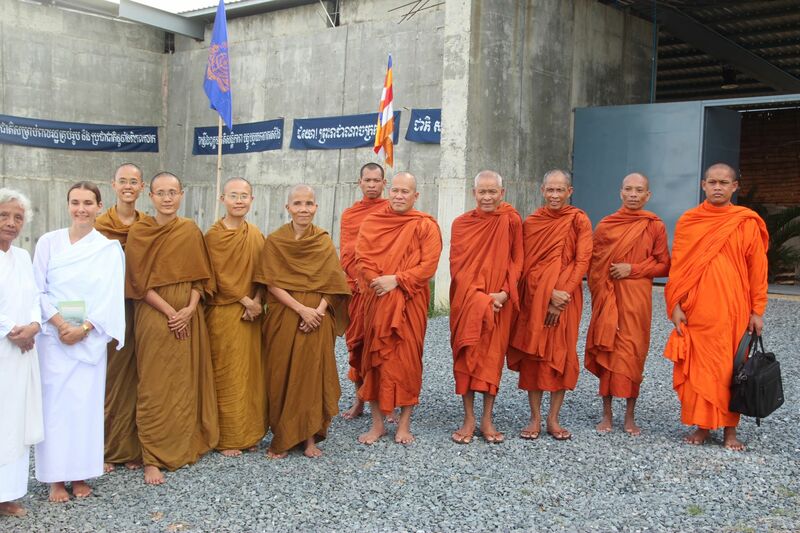 A new topic, based on it, has been created as "Personal impressions visiting Pañña &amp; Maha Pañña - Nun-monastery, វត្តបញ្ញាធំ " or attached there. Since Asians are most facebook addicted and lazy in using merits-making tools in this realm as well as letter/email, and since it would be good to give access to here, maybe Nyom Cheav Villa can try get in usual ways, personal or via fb, in contact, asking about requirements, so that they can use given and be able to abstain from using not really given, binding means like "Villagers" go into the forest or using "free"-things, having many other refuges then the tripple gems in use. Of course it can be impossible or difficult like in the many Bhantes cases... so no fear of getting rejected. Once offered in all possible ways, correct, all possible problems others could have considered, is then the time of letting go if required and not just after a deal. The community of Ven. Pabbajjas ( Maha Panna Foundation ) has given some pictures to share the merits of others and my person has received them for the Sangha. May all coming in touch rejoice by the merits done their and here and may the Devas inform those not having been touched yet. Wat Pañña has Donjī (nuns) with good heart (citta) and provides with a clean, silent and pleasing enviroment, and welcoming hospitality. 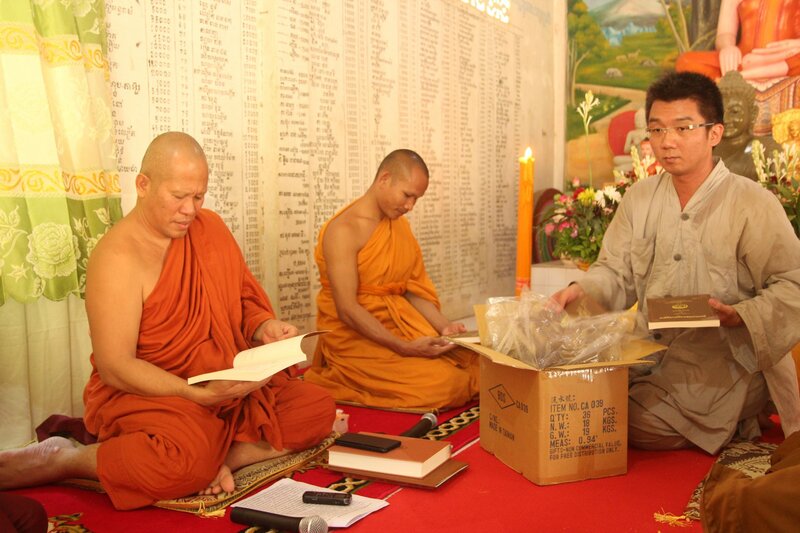 my person is currently again not sure about the "Dhamma-Dana" books shared carrying the Maha Panna Foundation origin. There are two issues. 1. 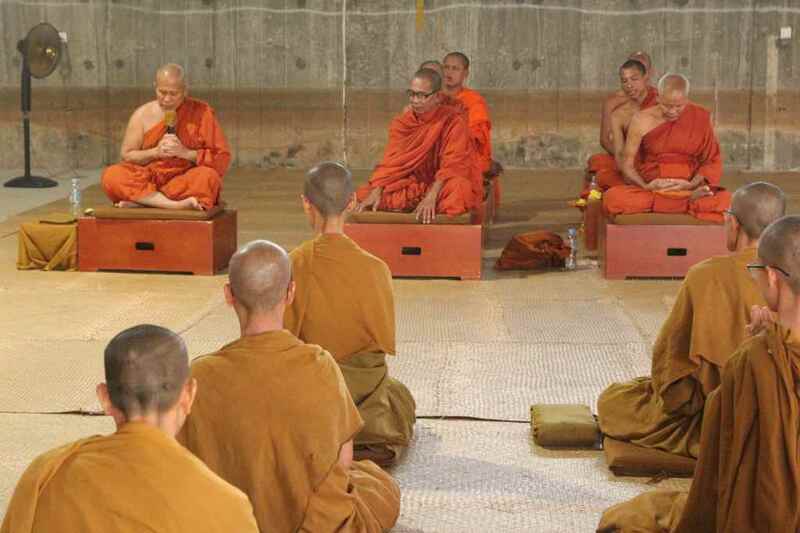 Since there is no such as a "shared ownership" between the two co-religions of Bhikkhus and Bhikkhunis, the use must be probably given by lay people or Samaneras, so that the Sangha of Bhikkhus could make use of it without dangers. Not sure how it worked before to become such. 2. My person, personally is not sure if the use can be seen as given in manners of "taking in trust". Special problematic if the use is owned by the Bhikkhuni Sangha. Maybe it's possible to get clearance about the matter, althought surely not an easy task with the requirement of assistance of Monks having enough faith and knowledge in regard of Vinaya. "Teaching" by Bhikkhunis toward Bhikkhus might have also certain problems included, especially in regard of Vinaya, as far as my person sees. Aside there is of course the general acceptance hindrance. Woman generally in history, althought having done great works again and again, would have acted always in the background. Maybe some stories of even great translator in Thailand are known, for example.